Southern Illinois University Edwardsville alumnus Ed Hightower is among the eligible candidates for the Naismith Memorial Basketball Hall of Fame Class of 2018 announced Thursday, Dec. 21. Hightower was a nationally recognized, award-winning NCAA basketball official for 36 years until retiring after the 2013-14 season. A press conference announcing the finalists from the North American and Women’s committee for the Class of 2018 will be held during NBA All-Star Weekend, which is scheduled for Saturday, Feb. 17 in Los Angeles. The entire Class of 2018, including those selected by the direct elect committees, will be unveiled during the NCAA Final Four in San Antonio, Texas in April 2018. Long recognized as one of the preeminent officials in college basketball, Hightower refereed 12 NCAA Division 1 Final Fours. He also officiated the 1990 World Championship of Basketball in South America, the European Basketball Championship in 1993, and the Goodwill Games in 1994 and 1998. He is a member of the SIUE Cougars Hall of Fame and the St. Louis Sports Hall of Fame. Hightower has a lifelong relationship with SIUE. He was the long-time superintendent of the Edwardsville School District until his 2015 retirement and was widely recognized for his efforts as the first African American superintendent in the district’s history. His commitment to SIUE has included serving on the SIU Board of Trustees, being a member of the SIUE Alumni Association Board of Directors and chair of the Academic Affairs Committee. Hightower currently serves as the executive director of the Mannie Jackson Center for Humanities. He also sits on the board of directors for both Lewis and Clark Community College in Godfrey, and St. Anthony’s Hospital in Alton. 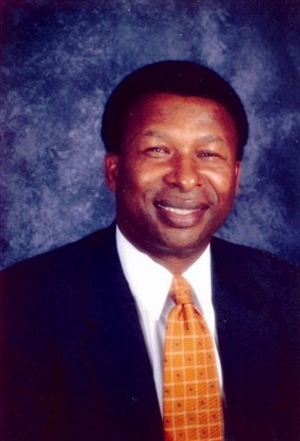 Among Hightower’s non-sports awards, he received the 1990 Elijah P. Lovejoy Human Rights Award, the Illinois Jaycees 10 Outstanding Young Persons Award, the 1989 Illinois Distinguished Principals Award, 1993 Illinois Principal of the Year Award, and he was selected as the 2007 Trails West Distinguished Citizen of the Year. Hightower has earned three degrees from SIUE, a bachelor’s in physical education in 1974, a master’s in education in ‘77 and a specialist degree in ‘91. He earned a doctorate in education from Saint Louis University in ‘97. Enshrinement festivities will take place in Springfield, Mass., Sept. 6-8, 2018. Tickets for the various Naismith Memorial Basketball Hall of Fame Class of 2018 Enshrinement events are on sale at www.hoophall.com. Photo: SIUE Alum and Naismith Basketball Hall of Fame candidate Ed Hightower.